Riders should have experience bicycling on all kinds of roads, as the departure point is in town, and riding in traffic at the start of every ride is unavoidable. Please make sure you've had a good breakfast for the Saturday rides - you don't want to be the one who bonks! Dress appropriately, in layers; in spring and fall, the Saturday rides often start when it's quite cool, and finish when it's quite warm! Riders’ bikes should be road bikes in good condition. Basic or high-end, no one will look your bike askance! Please make sure it is in proper working order, with a recent tune-up. Check your tires (and tire pressure), chain and brakes. A floor pump is available at the shop for a quick last minute pressure check, but for more substantial maintenance and repairs, please contact the shop and make an appointment well in advance. Please carry the basic repair kit with you: spare tube, tire irons, pump and bike tool. Riders should know the basic rules of the road. 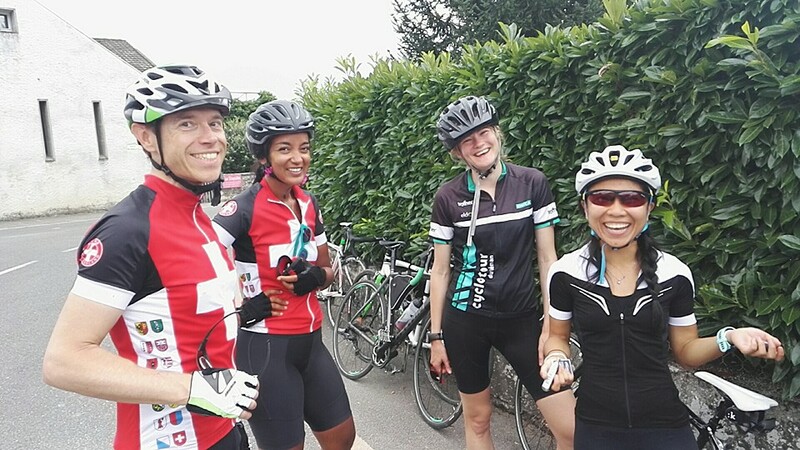 We ride as a group, but not as pace-lining peloton, except maybe occasionally on the fast rides. Once we're out in the open, on quiet roads, we tend to be a bit more dispersed, so you might find yourself riding by yourself or in a smaller group, but the others will always be in sight. Don't be embarrassed or intimidated if you're a beginner. The guides will go over basic riding etiquette and hand signals before each ride. Most important rule: pay attention! To yourself, to the road, and to others.